Levi Lyons, 5, takes aim on the mini-golf course at Congo Falls in Margate City, NJ on August 20, 2018. MARGATE, N.J. — Video games and movies used to be the go-to activity on gloomy days in Margate. That might be changing, some say, with Margate's newest (and controversial) miniature golf course. A two-story, 18-hole course, called a "monstrosity" by some when plans to build it were announced, opened last month to much fanfare. It has waterfalls, a giant animatronic gorilla, and a once-functioning airplane. Despite its Disney-like feel, neighbors slammed plans for the development at a Planning Board meeting last year with concerns about parking, loud music, and nighttime hours. One resident, Ed Blumenthal, filed a zoning lawsuit against the owner in March as fears swirled that Congo Falls Adventure Golf would transform the feel of Margate's shopping district. But for families traversing the Ventnor Avenue course on an overcast Monday, the drama was a distant memory. Many were happy miniature golf had finally landed in a town they say sorely needs more recreation for children. "You can't have a community without activities," said Steve Shapiro as his grandson sank a ball into the seventh hole. Since the course opened, Shapiro has played the course five times. Miniature golf, a quintessential part of the New Jersey Shore experience, hadn't been in Margate for more than a decade. In the 1990s, the last course, on Jefferson Avenue, closed. In recent years, teens looking to kill time in the town of 30,000 have congregated by the hundreds in the Wawa parking lot on Ventnor Avenue, dubbed "Club Wa." Steve Shapiro of Ventnor gives advice to Vikram Verma as they play mini-golf at Congo Falls in Margate. Operations manager Kevin Kelly said he has heard a handful of complaints from neighbors about the noise, with hundreds of players drawn to Congo Falls each day. In response, the course turns down the music at 10 p.m. and the last golfer enters at 11 p.m, with games winding down a half-hour later. To address parking concerns, a bike rack is being added. Two parking spots the developer won a variance to eliminate were restored. "We're here to stay, so we want to be a good neighbor," Kelly said. Blumenthal dropped his suit in April after he said he earned some concessions and the owner offered to pay $4,000 to cover his legal costs and repay those who contributed to the fund-raising page to pay those bills. He announced his withdrawal in a Facebook post titled "Détente & Pragmatism." Blumenthal declined to comment for this story. Before opening, Kelly said he received more than 100 applications from kids looking for a summer job. Of those, about 15 were hired. Most are tasked with vacuuming the green, keeping the course clean, and collecting stray balls. Several features have been added in the last month. A group plays a round of mini-golf at Congo Falls in Margate. The two-story course recently opened. In late July, added atop a rock formation next to the rope bridge was a small, once-functioning plane that was owned by a man living in Upstate New York and transported hundreds of miles to the Jersey Shore. The sensory robotic gorilla now sits inside a cage next to one hole and speaks whenever players walk past it. Full-year Margate resident Jim Duncan lives across the street from the course. All spring, he and his wife listened to the loud sounds of construction only a few hundred feet away. Once the excavators and water pumps cleared out, though, Duncan said he was pleasantly surprised by a golf course that he said looks more like a park, with flowers and trees. The street is busier, Duncan said, but he sees that as a good thing for Margate's businesses and families. "If you don't like people, then you're in the wrong place. That's the Jersey Shore," Duncan said. 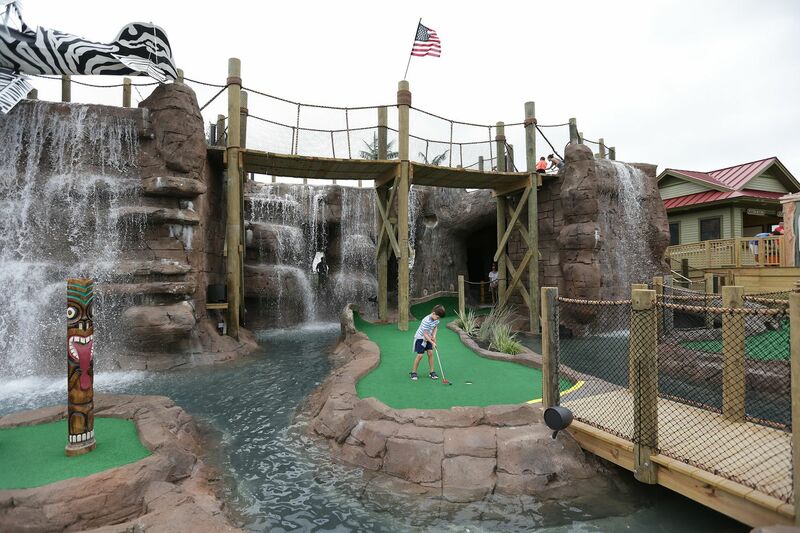 The Margate course is one of seven mini-golf spots owned by Mark Benevento in Cape May and Atlantic Counties, including in Avalon, Ocean City, and Sea Isle City. A street-level view of the new Congo Falls mini-golf course in Margate.